Carnival season is about to begin around the world and cities like New Orleans and Rio de Janeiro are ready to party! 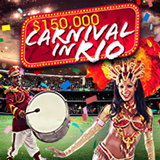 Starting this week, Intertops Casino players are dancing their way up the "Carnival in Rio" leaderboard to collect $150,000 in casino bonuses. Every Monday until March 6th, 300 frequent players will get bonuses up to $500 each. And every Thursday, 50 randomly selected players will get additional bonuses. Then, after the final samba, one player will win a $1000 grand prize. Carnival in Rio Casino Bonuses contest details. Earn frequent player points when you play at Intertops Casino. Top point-earners receive the biggest bonuses – a total of $30,000 in prizes every week. Each week, the top 20 players on the scoreboard are entered in a final draw for a $1000 cash prize at the end of the promotion. But here are bonuses for occasional players as well! Just deposit and play as little as $25 between Monday and Wednesday and you're eligible for additional Thursday bonuses of up to $150. Frequent players win bonuses up to $500 weekly during Carnival in Rio bonus event. Perfect Slot Game for Carnival! Intertops Casino offers hundreds of slots and table games from Realtime Gaming. Samba Sunset is a carnival-themed game that’s perfect if you're in the mood for a fiesta. Samba Sunset is available in the online casino for desktop and laptop players and, like most of the casinos newest and most popular games, is also offered in Intertops’ new mobile casino for smartphones and tablets.